Enrollments may be used as gifts for special occasions, such as birthdays and anniversaries. Daily remembrance in the prayers and good works of the Sisters. First Saturday Liturgy each month for all deceased members. These benefits will be offered as long as the monastery exists. A donation to cover postage/handling costs is highly appreciated. For a mail in form click here. Click to submit form and donate through PayPal. 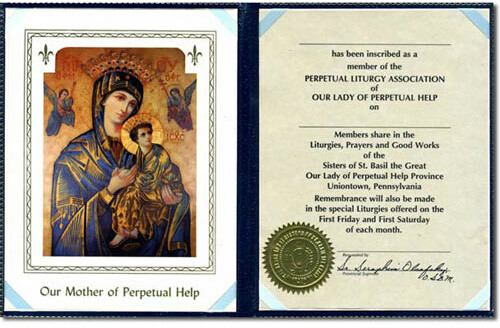 Enroll a friend or loved one for remembrance throughout the year in the Divine Liturgy, the Prayers, and Good Works of the Sisters of St. Basil at Mount St. Macrina at Uniontown, PA. Suggested donation for each Enrollment Gift Card: $5.00. Enrollment Gift Cards are available for Birthdays, Sympathy, Get Well, and All Occasions. 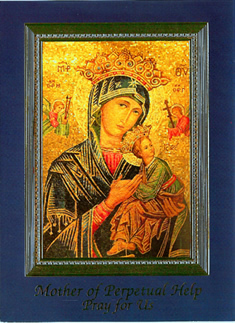 The cover of each card is the Icon of Our Lady of Perpetual Help in full color, framed in gold, on a rich dark blue background as shown.